Hawaiian Airways flight 33 flew in circles for 2,5000 miles last Friday over many hours of frustration for passengers. The plane was forced to return to LA on three separate occasions due to pilot concerns. 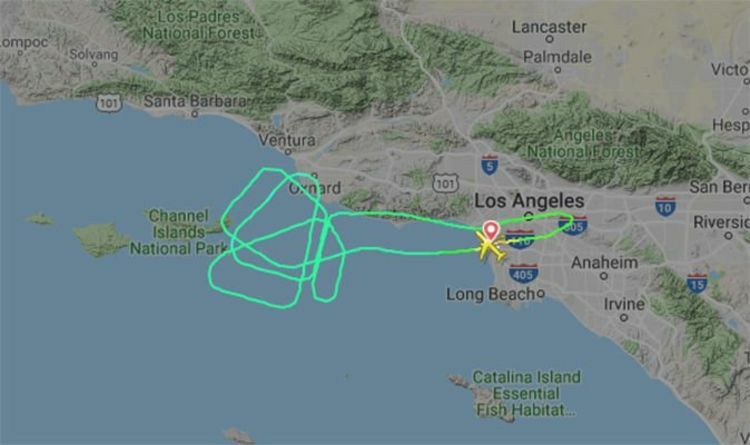 More than 200 passengers were on board the flight as it circled over the Pacific just off the Californian coast. A spokesman for the airline said long-haul flights are subjected to more stringent “safety requirements”. He said: “Safety is our top priority, and we apologise for the inconvenience to all our guests. They said they are refunding passengers and adding $100 credit for future flights. Images on flight tracking website Flight Radar showed the plane repeatedly looping back and forth. One one occasion the plane flew for 5-and-a-half hours without passing the Channel Islands National Park, just off the California coast. Among the passengers on board was a musician flying to Hawaii to play a gig. RavensFly said on Twitter they would now miss the show due to the delays. He said: “My band was on flight 33 yesterday at 9 and we are STILL here 24 hours later because they can’t get us on a flight.